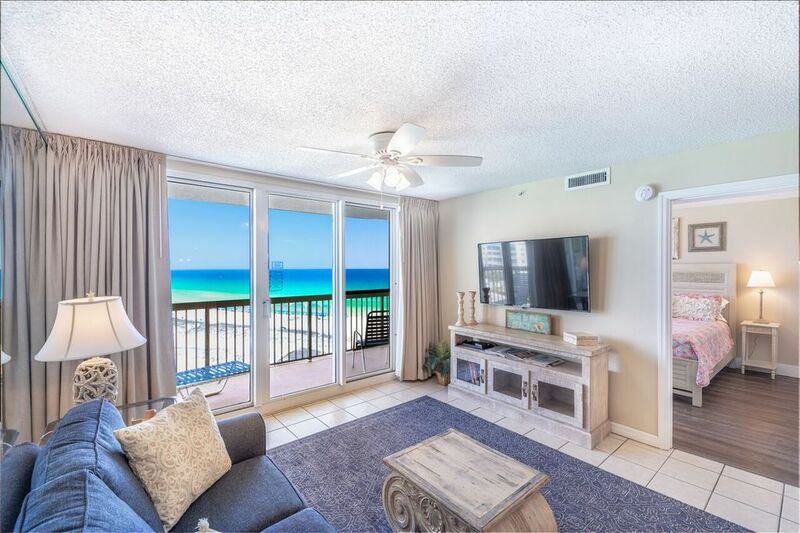 Relax and enjoy your vacation in this beautifully decorated 2Br/2Ba unit on the 9th floor at Pelican Beach Resort. Fabulous Coastal View! The living area and master bedroom open onto the balcony overlooking the beautiful emerald water and that gorgeous white sandy beach. Pelican Beach Resort offers deeded private beach, beach service, kayak rentals, and indoor/outdoor pool, children's pool, hot tub, tennis courts, seasonal Gulf front beach bar, poolside deli cafe, a sundries shop, game room, covered parking, dry sauna, steam bath, spa and fitness center, picnic area with fire pits and grills, 24 hour front desk and security, on-site manager, banquet and conference facilities, plus the best part - the beach is right in front of you! Our kitchen is updated with stainless appliances and granite counter tops. The master suite offers a king size bed while the guest bedroom offers 2 twin beds. Living room has a fold-out queen sofa bed for extra sleeping space along with a 55" LED TV and blu-ray player. Two level parking garage on the North end of the building with grounds parking through out the resort. Boat Rental at nearby DestinHarbor. Water Park across the street! Entire property was very nice and unit was comfortable. We appreciated having the extra room & bathroom in this unit. It made for a very restful vacation! The unit owner was amazing to work with...very communicative and always replied very quickly to concerns or questions. Highly recommend doing Walmart grocery pick up for your supplies! Ordered on the way down and picked up when we got in glen. Saves a ton of time!! Thanks Tommy for a wonderful vacation! This condo was great. It was well stocked with everything we needed including some chairs and umbrellas to take down to the beach. It was really clean and very comfortable. We would definitely stay in this condo again. Can’t say enough wonderful things about the condo and it’s owner. First off, Tommy is the most accommodating owner I have ever encountered. He reached out to us the second we booked the condo and continued to communicate up until we walked in the door, to make sure everything was ok. He is such a nice, hospitable owner and a pleasure to work with. The condo itself is beautiful, clean, and spacious enough for our family of five, including three rowdy boys. The views are amazing and the Pelican is central to many restaurants, shops, and attractions. It was a wonderful stay and we plan on going back soon! My mom, sister and I stayed 4 nights here and it was absolutely perfect. Tommy was so great communicating with us prior to our trip. He made sure we had every piece of information we needed without us even asking. Upon arrival, we checked in and received our wristbands from the front desk. The room was beautifully decorated and had an outstanding view and large balcony. The room was very clean and fully furnished. We will definitely be staying again. I cannot say enough good things about Tommy and the room. Thank you for having such a beautiful place to vacation. The condo was nice. It’s conveniently located. Would definitely use again.